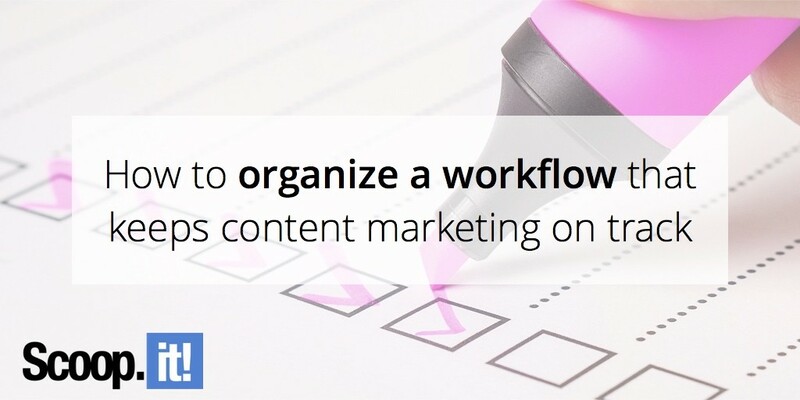 A well-planned workflow is crucial to keeping your content marketing efforts on track and ensuring that you meet your goals. You may often find that you are receiving content late from your team, that it’s not up to scratch, has been rushed, or just never materializes. The tips in this article should help you to get back onto the straight and narrow. Before you or your team get stuck into creating more content, make sure that you’ve read through the following points to keep your projects flowing productively. A workflow simply refers to the pattern and process in which a team works – it’s a routine or an agenda but one that’s planned logically to get the best results in the most efficient timeframe. Every team has one or more, depending on the number and types of projects they are involved in. A productive workflow should be able to be presented visually so that you and your team can see the stages and responsibilities with ease. This way it’s easier for the team to see where they are and what action is needed to achieve the goals and targets. These can then be placed in a ‘Gantt Chart’ or ‘Swimlane Diagram’ for reference (these are visual graphs which show who is doing what task at what time, and how the fit together). Why is it important to articulate your workflow? All teams who are working together to create something will develop some form of workflow naturally. Tasks will be completed, individuals will assume roles, and a pattern which repeats will develop. However, if a workflow is left to form completely naturally like this, you risk exposing yourself to duplication, inefficiency, and risk a team becoming unproductive. It’s much more effective to define a workflow from the top down, which can then be monitored and adjusted to make sure everything is arranged in the best possible way for maximum production in terms of both quantity and quality. 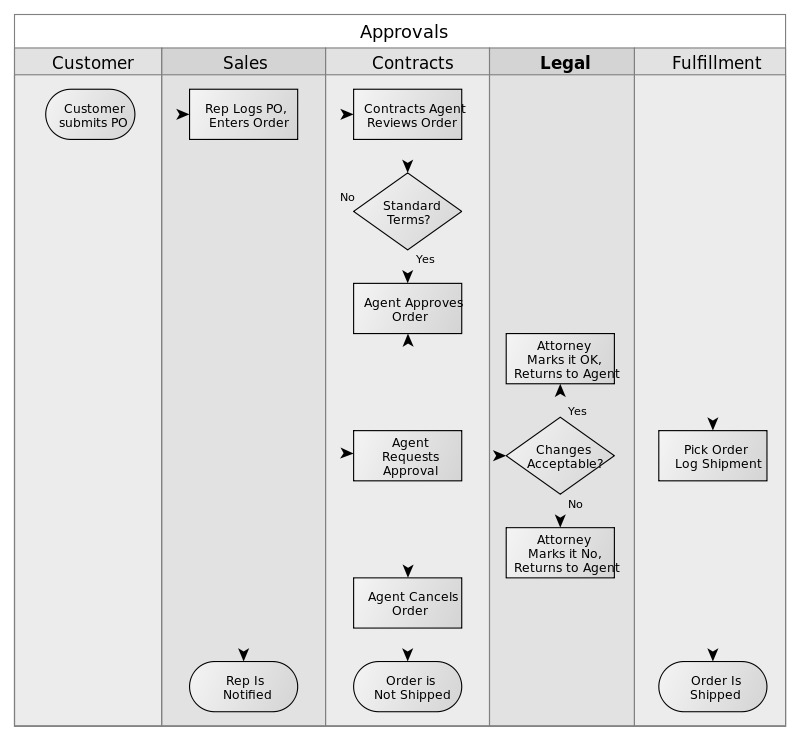 A well-structured workflow enables a team to visualize a breakdown of tasks, identify at what stage everything needs to be completed, and be aware of who is working on each task. They will also know when things need to begin and end. At every stage of the process, the responsible person knows when it’s their turn to work, exactly what they are expected to deliver, and when. While it’s important to create a clear workflow, it should be a workflow that feels natural to your team, so listen to the roles they are already taking and the terms they are using in their work. Firstly, identify what roles have emerged in the content creation process and who is fulfilling each one. From here, you will be able to further break down a list of the tasks which need to be included in your workflow and there will likely be some that you haven’t yet considered. For each task, gather as much information as possible so that there’s minimal room for questions and error. Your workflow should work to minimize all confusion about the work at hand. If there are too many details to put into the workflow itself, such as policies, style guidelines, or similar, then have this in an easily accessible document elsewhere and direct members of your team to it via the workflow. No points in the workflow should be vague. Tasks should be fully detailed and individual names put to each task so that there is no confusion about who takes responsibility for each task. Once this is done and your team is fully aware of their responsibilities, you can begin to plan the time frames which your team should work to. It’s important to be specific when defining deadlines and time frames for tasks to get done. No one has ever been motivated by a vague deadline such as ‘next week’ or even ‘tomorrow’. You can guarantee that will mean ‘the end of next week’ or ’11:59 pm tomorrow’ despite everyone having the best of intentions – it’s just how people function. Set a hard, defined deadline and expect people to meet it. Now that you’ve put the time and effort into designing your workflow, identifying who works on what stages and when they must be done by, the process won’t just run itself. Because everything is interrelated, it can be beneficial to have someone whose responsibility is to ensure the smooth running of your workflow. This individual, whose job it is to oversee the project, will be the one who keeps each piece of content moving through the workflow as it should. They could be a project manager, content strategist or even a marketer; what matters is that they understand the process and can look at it from an outside perspective to analyze where any issues or bottlenecks are arising. They will then know how to work together with staff to rectify these issues. As well as having a team member to oversee the workflow, various copywriting tools exist which can smooth the process of content creation by your team. There is an extensive range of tools available online that can help you to deliver high-quality content that is ready for use and requires minimal revisions. Here, we will explore a list of tools that are ready for instant use, making it easy to stick to your workflows, assisting you in meeting those predetermined deadlines. A fantastic method to staying in the loop in the marketing industry is by using feed tools. With these feed tools, it is easy to maintain a current knowledge of things that are happening in the marketing world right now, allowing you to exercise these practices in your own teams. 1. Inbound is a great tool that can be useful when trying to keep up with the ever-changing landscape that is the marketing industry. It’s free to sign up and after setting up an account and choosing your preferred topics, you’ll begin to receive information and articles relating to your line of work. By reading these articles, you’ll be able to learn new marketing techniques and practices which can help you with your own projects. 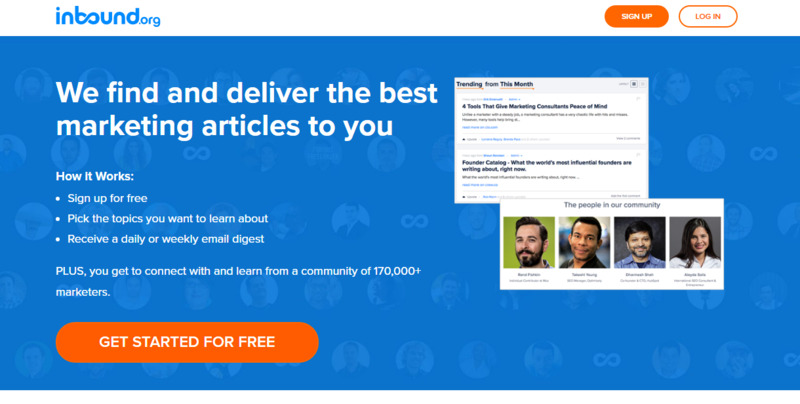 As well as sourcing articles for you, Inbound also allows you to connect to their community, allowing you access to over 170,000+ marketers, meaning you can network and learn at the same time. 2. When you’re looking to bring your teams together to work more productively and more efficiently, Trello offers an amazing service that will help you streamline your entire workflow. Using an extremely visual presentation of boards, lists and cards, Trello gives marketing teams the opportunity to stay on step ahead in every project they undertake. Multiple users can be easily added to one central database and use the latest cloud technology allows members of the team to access the project anytime, anywhere. Teams are able to create visual checklists so it is easy to track how far along a project is and it’s easy to add files and other forms of media that really helps to boosts a team’s performance. 3. When marketing content on social media, things can get very confusing very quickly. If you’re handling large volumes of content that are spread across a lot of social media accounts, it’s easy to get muddled up and disorientated if not organized properly. That’s where Buffer comes in. Available for individuals and business (in separate packages), it’s now easy for marketing teams to stay organized and one step ahead at all times. Buffer allows teams to schedule social media posts, allows for RSS feed integration and provides market leading analytic results, enabling teams to look back and view what posts are working and what posts are not. 4. By using platforms such as Yoast, marketing teams are able to maximize their content’s reach and audience engagement quickly and effectively, allowing them to gain time to use on other projects and enhancing their existing tasks. 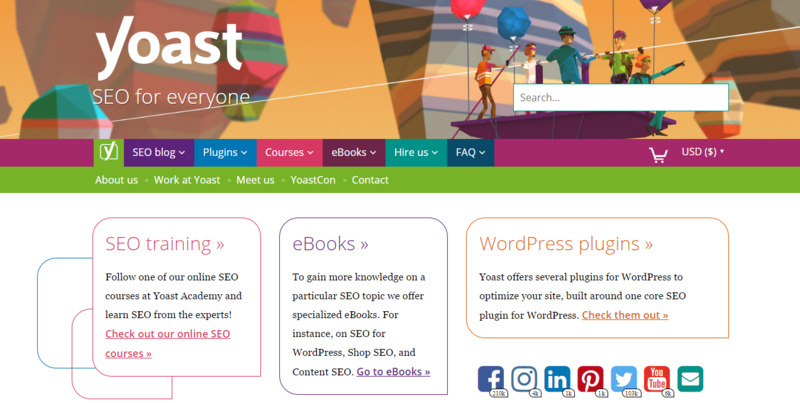 There is also a wide range of SEO training material to be found on Yoast that could greatly improve the skills of your team members. When it comes to creating the actual content itself, there are multiple ways in which workflows can be made more productive and more efficient. 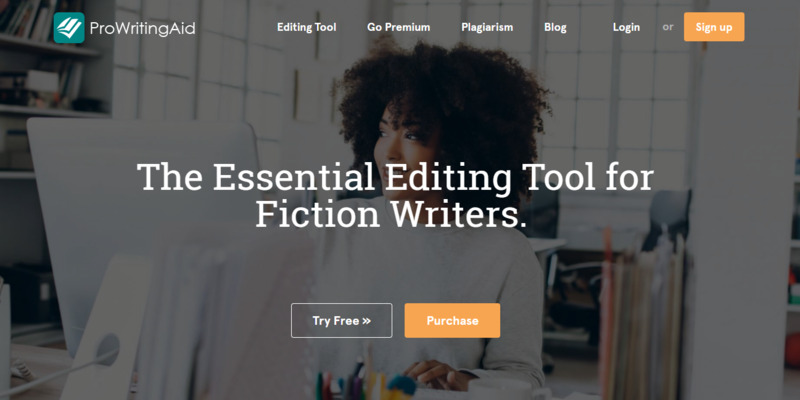 By using a variety of online tools and services, such as ProwritingAid, Paper Fellows or Academized content writers are able to produce high-quality articles and blog posts in a fast and timely manner, allowing them to easily achieve deadlines, freeing up time for them to produce larger quantities of work. Such copywriting and proofreading online tools as Oxessays or Bigassinments enable content writers to upload their articles and blog posts to be checked and perfected by another qualified writer. Service buyers are able to choose what type of service they require, how many pages they need to be edited or proofread and how quickly they need the work delivered. Although managing content marketing teams can be stressful and chaotic, with a well-formulated workflow and by fully utilizing available tools, management can become easy, projects can be completed in a timely and efficient manner and clients can be satisfied. By using tools, such as the ones mentioned above, the workflow can be continuously streamlined, ensures the workplace remains productive, stress-free and operating to its full potential, at all times.